Not the most glamorous town around, but Tuaran is a great stopover if you are traveling to the east coast of Sabah or on your way up to Kinabalu National Parks where Mt. Kinabalu is located. The name Tuaran is believed to have come from the Malay word tawaran which means 'bargaining' or 'sale'. This presumably reflects on the town's earlier role as a market where natives from the hillside villages brought their produce for trading with the coastal Chinese and other indigenous peoples. It is a town as well as a district located in West Coast Division, in the northwest of Sabah, East Malaysia on the island of Borneo. 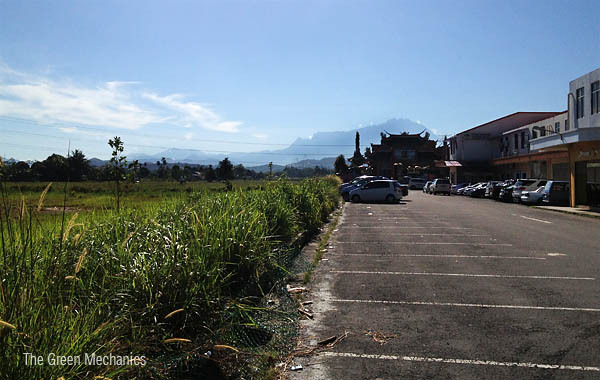 Tuaran district has an area of 1,166 square kilometres and an estimated population of 105,453 in 2010. About half the population consists of ethnic Dusun, a third ethnic Bajau, and some Chinese. It has a distinctive nine-story Chinese pagoda as a prominent landmark. Nearby tourist attractions are the Mengkabong Water Village and the Penimbawan Water Village, with stilt houses built by the Bajaus over the shore. Thanks. Will post more on Tuaran later. There is always a story behind most of the name of places in Sabah.